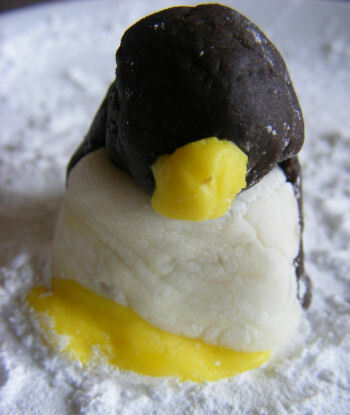 You can make about 30 of these fondant penguins with this recipe - it's great for a group to do, or as a treat to serve at a children's Christmas party. Put 300g of icing sugar in a bowl. Add 2 drops of peppermint essence. Add condensed milk a tablespoon at a time (should take about 4-5), mixing until you get a smooth dough. Take about 1/4 of the dough and knead in a drop of yellow food colouring, adding more icing sugar if needed to get it to a "modelling" consistency. Put 400g icing sugar and 50g cocoa powder in a bowl and mix. Add a couple of drops of black food colouring. Add condensed milk a tablespoon at a time (should take about 5-7) mixing until you get a smooth dough. 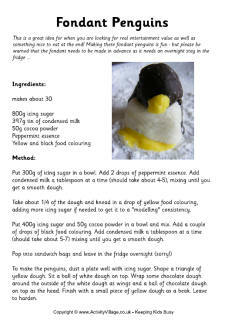 To make the penguins, dust a plate well with icing sugar. Shape a triangle of yellow dough. Sit a ball of white dough on top. Wrap some chocolate dough around the outside of the white dough as wings and a ball of chocolate dough on top as the head. Finish with a small piece of yellow dough as a beak. Leave to harden. 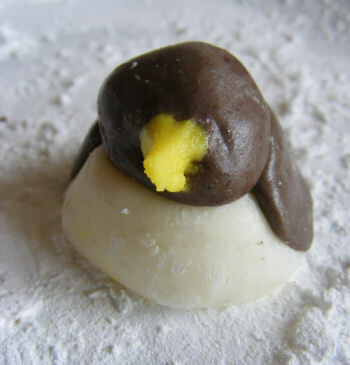 This fondant penguin doesn't have the yellow base underneath, but he still looks very cute! This penguin card is made with basic construction paper or card supplies, our printable template, and a set of googly eyes! Fun for Christmas or perhaps winter birthdays? There's plenty of room for writing a personalised message on these cute penguin feet bookmarks, or you could use them for Christmas place settings and write a name on each one.